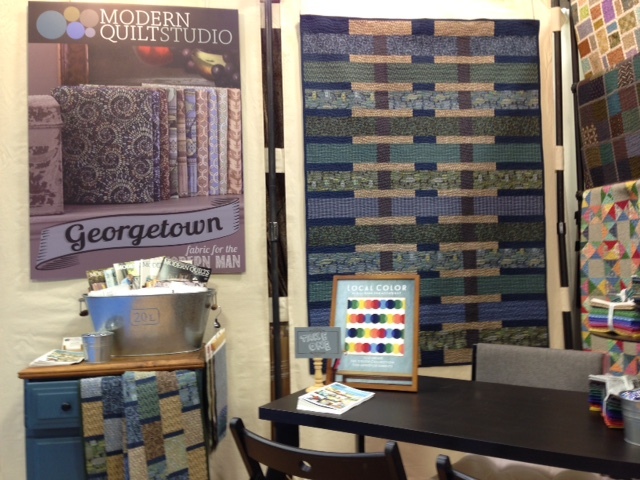 Modern Quilt Studio is at Spring Market! Oh so many things to show at Spring Quilt Market! Our Georgetown Line for Andover Fabrics has even made it into a little winter coat for a dog (see lower right of photo). Remember our Covent Garden quilt from Modern Quilts Illustrated #4? Look how handsome it looks reimagined in Georgetown fabrics! If you’re interested in a limited edition kit, click here. There’s also a free pattern for the sample quilt, Embassy Row, shown draped over he drawer of the small blue chest. Truth be told, Bill and I rescued that little chest from the curb in front of a neighbor’s house on garbage day. The sides had water damage and one side had a hole kicked in it. It had a cheap finish in an ugly color and forgettable hardware. With a little masonite repair to the sides, sanding, stain on top, Annie Sloan chalk paint and wax on the body and some new hardware, it looks great in the booth! We have two other lines debuting with Andover Fabrics, Barbados and The Gray Collection, a sophisticated black, white and gray collection that pairs beautifully with The Color Collection. Andover also handed out tote bags made from one of our prints at the Schoolhouse classes that shop owners and the media attend the day before Market begins. 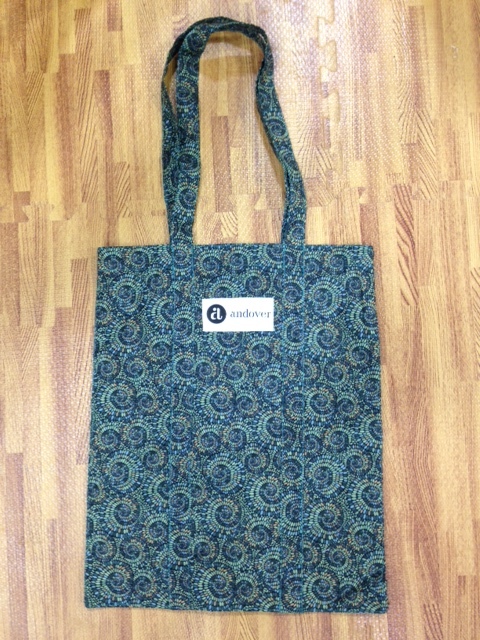 Here’s a shot of the tote bag made with the Dumbarton print, one of our favorites. Oh and do you see that section of a beautiful quilt in the Craft Nectar banner? 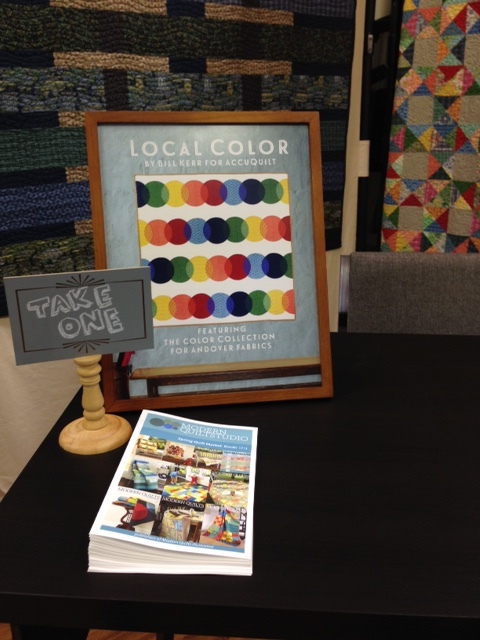 It’s a new die cut Bill designed for AccuQuilt called Local Color! Here’s the shot in the booth of the entire quilt. AccuQuilt will have the pattern and the dies. The die will be available on the Accu-Quilt website on Monday. If you happen to see Bill in the booth, he might even be wearing the beautiful shirt we made for him using one of the Georgetown prints. We’ll post specifics about the shirt next week should any of you want to try your hand at making shirts for Father’s Day. I’m drooling over Barbados! Oh, pardon me while I dry my chin :) Your booth is beautiful–thanks so much for the photos. Keep having a great time and give us a pic of Bill in his new shirt, please!